The following article written by Ron Hayes was originally published in The Coastal Star, a local newspaper serving Highland Beach and the coastal Boca Raton area. “Play ball!” the loudspeaker crackles, and one by one the players emerge from the dugout and head to home plate. Some strut forth eagerly, and some shuffle awkwardly. Some push walkers, and some are pushed in wheelchairs. “Let’s make some noise!” the loudspeaker demands. “Nice and loud! Nice and loud!” And the throng behind the hurricane fence explodes in hoots and whistles and cheers as the first player pounds the plate with his bat. And then the pitcher releases the ball — a bright DayGlo green training ball, soft as a tennis ball, larger than a softball — and the Miracle League of Delray Beach’s eighth annual season has begun. One evening in January 2005, Julia Kadel and her husband, Jeff, were watching when HBO’s Real Sports with Bryant Gumbel broadcast a segment on a Miracle League team in Atlanta. “That’s what we’re going to do,” she informed him. 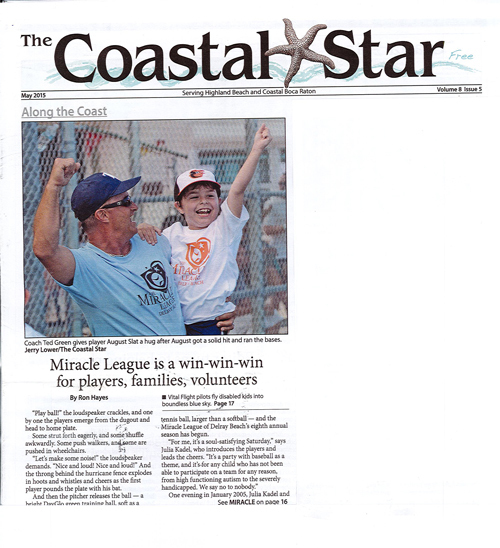 The city’s Parks & Recreation Department supported their plan, the City Commission gave them $10,000 to get started, and in 2007 the Miracle League played its first game. 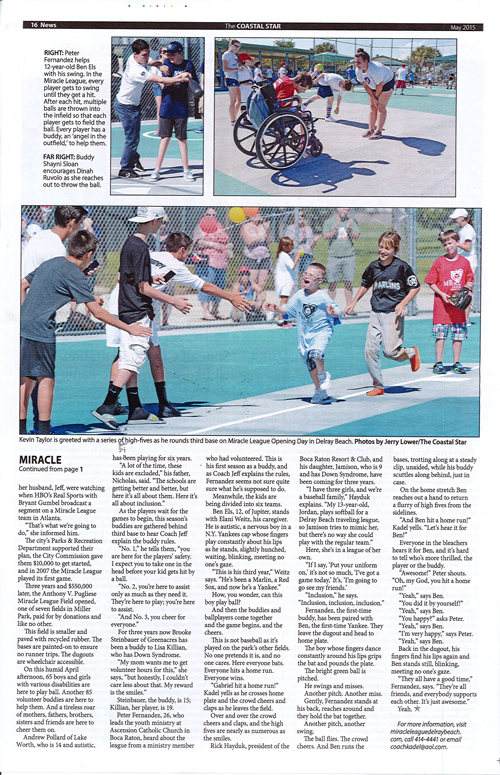 Three years and $550,000 later, the Anthony V. Pugliese Miracle League Field opened, one of seven fields in Miller Park, paid for by donations and like no other. This field is smaller and paved with recycled rubber. The bases are painted-on to ensure no runner trips. The dugouts are wheelchair accessible. On this humid April afternoon, 65 boys and girls with various disabilities are here to play ball. Another 85 volunteer buddies are here to help them. And a tireless roar of mothers, fathers, brothers, sisters and friends are here to cheer them on. Andrew Pollard of Lake Worth, who is 14 and autistic, has been playing for six years. As the players wait for the games to begin, this season’s buddies are gathered behind third base to hear Coach Jeff explain the buddy rules. “No. 1,” he tells them, “you are here for the players’ safety. I expect you to take one in the head before your kid gets hit by a ball. “No. 2, you’re here to assist only as much as they need it. They’re here to play; you’re here to assist. For three years now Brooke Steinbauer of Greenacres has been a buddy to Lisa Killian, who has Down Syndrome. Steinbauer, the buddy, is 15; Killian, her player, is 19. Peter Fernandez, 26, who leads the youth ministry at Ascension Catholic Church in Boca Raton, heard about the league from a ministry member who had volunteered. This is his first season as a buddy, and as Coach Jeff explains the rules, Fernandez seems not quite sure what he’s supposed to do. Meanwhile, the kids are being divided into six teams. Ben Els, 12, of Jupiter, stands with Elani Weitz, his caregiver. He is autistic, a nervous boy in a N.Y. Yankees cap whose fingers play constantly about his lips as he stands, slightly hunched, waiting, blinking, meeting no one’s gaze. How, you wonder, can this boy play ball? And then the buddies and ballplayers come together and the game begins, and the cheers. This is not baseball as it’s played on the park’s other fields. No one pretends it is, and no one cares. Here everyone bats. Everyone hits a home run. Everyone wins. “Gabriel hit a home run!” Julia Kadel yells as he crosses home plate and the crowd cheers and claps as he leaves the field. Over and over the crowd cheers and claps, and the high fives are nearly as numerous as the smiles. Rick Hayduk, president of the Boca Raton Resort & Club, and his daughter, Jamison, who is 9 and has Down Syndrome, have been coming for three years. Here, she’s in a league of her own. Fernandez, the first-time buddy, has been paired with Ben, the first-time Yankee. They leave the dugout and head to home plate. The boy whose fingers dance constantly around his lips grips the bat and pounds the plate. The bright green ball is pitched. Gently, Fernandez stands at his back, reaches around and they hold the bat together. The ball flies. The crowd cheers. And Ben runs the bases, trotting along at a steady clip, unaided, while his buddy scuttles along behind, just in case. On the homestretch Ben reaches out a hand to return a flurry of high fives from the sidelines. Everyone in the bleachers hears it for Ben, and it’s hard to tell who’s more thrilled, the player or the buddy. “I’m very happy,” says Peter. Back in the dugout, his fingers find his lips again and Ben stands still, blinking, meeting no one’s gaze.